I swear this is true. After many years of supporting Macromedia via our DirectorWeb site, I made a claim that I had never gotten anything in return fomr the company. Shortly, there after I got a cool t-shirt. 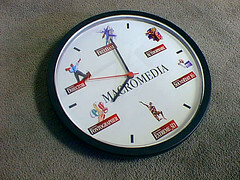 Then, sometime later, I got this nifty clock. I put the battery in, hung it on the wall, and a few days later it had stopped cold! And it was the same day they announced an end to the development of Director software.